With both major parties nominating corrupt, dishonest, authoritarian right candidates, one of the many regrettable features of this election is that we are not seeing very much serious discussion over policy. This weekend the campaign has turned into a battle of insults in which Hillary Clinton has the stronger case, but might have still lost to Donald Trump due to how she mishandled it. 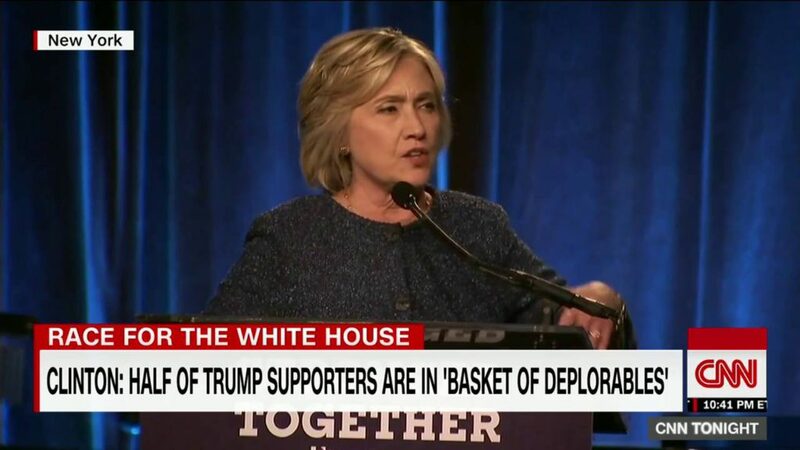 The battle began when Clinton said, “You know, just to be grossly generalistic, you could put half of Trump’s supporters into what I call the basket of deplorables. They’re racist, sexist, homophobic, xenophobic, Islamaphobic — you name it.” The link contains her full statement so it can be read in context. It is debatable as to whether the initial statement was wise and there is a separate debate as to whether it is accurate. This analysis from NPR is critical of her comments and argues, “There’s no data to support such a specific number.” They are referring to the “half” in her statement. However, Clinton did preface this as saying she was being “grossly generalistic” which suggests she was not claiming documentation of exactly fifty percent. The polling numbers cited by NPR and more explicitly by Think Progress (a pro-Clinton site) do actually provide support for her argument. Again, whether it was wise to make such a statement, or to make statements which are admittedly “grossly generalistic” about the opponent’s supporters, is a separate matter, but her statement as made can be supported by facts. It may have been easier not to say this and left herself vulnerable to a faux-populist counterattack. But she did say it. She cannot unsay it. And since it is not only basically true but in fact a matter of central importance to the entire election, it is truly critical that she not back down. If there’s nothing else we’ve learned from this cycle we should have learned the centrality of ‘dominance’ politics. Campaigns are performative displays of strength, resolve. To back down, apologize or cower would not only play into Trump’s dominance politics routine, it would make Clinton look weak. It would deepen suspicions that she has no beliefs or will change them out of convenience. Far more importantly though, backing down would demoralize her supporters since it would amount to apologizing for or backing down from and delegitimizing what is in fact a central truth of the election. After this was written, Clinton did back down. Here are some of the headlines. Actually it was not a full apology, and Clinton did stick to a key part of her initial claim. However, she still did back down in response to complaints from Trump and the right. In a campaign which is devoid of actual substance, and in which some Democrats are already worrying about how Trump is inching his way back into the campaign, this could turn into another point in Trump’s favor. Clinton loses her advantages from experience if Trump appears stronger–especially when Clinton already looks weak due to hiding from the press. Those Democrats who are worried that Trump can still win should keep in mind that Bernie Sanders was polling much better against Trump than Clinton during the primary battle, and if Sanders were the nominee, in contrast to Clinton, he would be talking about policy and ideas.